Armenian media outlets have nearly exploded as soon as February kicked in: the government sessions in Armenia will be held behind closed doors from now on. The controversial bill quickly became hot topic among both local and foreign analysts. Meanwhile, the government of Armenia tirelessly talks about European values, democracy, human rights and so on, while on the other hand it decides to shut out the country's population from the information considering state management. For a long time already speeches of the government representatives about the so-called “European choice” have been considered a primitive fallacy and an attempt to hide many sharp issues that seem to have appeared after the EU-Armenia association agreement, which, by the way, has nothing to do with democracy building and real European integration, but is rather connected with Sargsyan’s desire to reach his personal financial goals. This time, however, Sargsyan has gone too far and shown what kind of values are really important for him and his suite. “Armenian government approved a bill “On structure and functioning of government” providing a new position of a vice-premier on Feb. 1. Among important provisions – a decision to hold government sessions behind closed doors. Only in certain exceptional cases some parts of the sessions may be held openly,” said the reports of the Armenian media. And the “exceptional cases” will surely be very exceptional. Obviously, nothing really essential (of what Sargsyan’s regime desperately and vainly tries to hide from their own people) will be discussed at those rare open sessions. Moreover, the ruling party apparently decided to go the whole nine yards and leave no bridges behind: not one from the members of government will have the right to share information from sessions, according to Minister of Justice David Arutyunyan, who himself introduced the controversial bill. 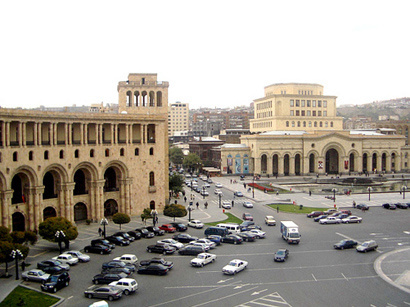 The news brought a storm of discontent both in and outside Armenia. Chairman of Helsinki Citizens' Assembly Vanadzor Office and human rights advocate Artur Sakunts was one of the first to comment on the whole issue. “Corruption, as well as lawlessness, irresponsibility and amorality tend to flourish in closed systems. This is a direct road to management methods of top-secret organizations,” he said. The civil advocate slightly missed the mark only by one point: Armenian government has become a top-secret, regime establishment from the very moment Karabakh warlords’ clan and their friends had settled down there and took a steering wheel in their hands. International organizations also criticized the “novelty” of state political life that continues to amaze all and everyone with its nonsense. “They [international institutions] expressed their concern to the Armenian government and noted that a country which chose a road of democracy cannot make such anti-democratic decisions. It contradicts the freedom of speech and runs counter to the European values, according to them,” Armenian media reports said. It doesn’t seem that Sargsyan and his sock-puppet government care about someone’s opinion on the matter though. Press-secretary of the ruling Republican Party of Armenia, Deputy Chairman of National Assembly of Armenia Eduard Sharmazanov already called the concerns “groundless”. He also shared a wordy discourse of his own, comparing the political systems of Germany, the UK and Israel with that of Armenia. It seems, he has forgotten that Armenia is nowhere close to the mentioned countries in terms of socio-economic indicators and the management in the country is carried out not by legit authorities, but rather impostors holding their own people in an oligarchic criminal captivity. Considering the upcoming political rearrangements in Armenia, during which Serzh Sargsyan plans to move to another position and keep all the power in his hands, according to many experts, it becomes clear what goals the closing of government sessions serve. The future prime-minister plans to try on Cardinal Richelieu’s red robe and control the country from behind the curtain not accounting to anyone. The government, in such case, will completely be transformed into an invitation only elite club. How far can Armenian political establishment go by the road of lies and hypocrisy, both in front of world society and its own people?